The marriage of Disney and Lucasfilm is a match made in heaven. Disney – the man and the company – spent the better part of a century trying to homogenize the world’s art and literature into its own marketable brand; George Lucas did it with a single film. Between its own cartoons and live-action films, Star Wars, and the Marvel superhero movies it produces, Disney now has something close to a monopoly on childhood imagination, and Uncle Walt’s dream of an eternal childhood is closer than ever. 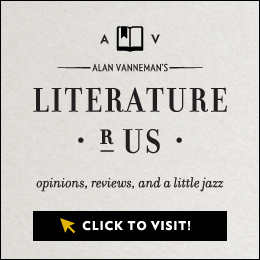 Folks who grew up on Star Wars and Disney princesses now delight in them as grown-ups with the smiling approval of the cultural mainstream, and the popularity of young adult fiction is skyrocketing because of fully adult readers. The escapism is inescapable. The problem with a new Star Wars movie is that there is so much to talk about but nothing to say. As the seventh installment in this self-styled “saga,” Star Wars: The Force Awakens is, by its very nature and design, insubstantial, calculatingly inoffensive, a collection of bite-size material details to be enjoyed, rated, and discarded. As an explicit sequel to the first three Star Wars films, it is inevitably wrapped up in many people’s adolescent memories of toys and home video, so discussion can easily degenerate into solipsistic nostalgia. As an implicit remedy for the Star Wars prequels, it is a meticulously crafted narrative packed with impressive practical effects and stripped of anything off-putting, leaving those who derided the prequels’ confusing storytelling and reliance on CGI nothing to complain about. Even if you find the movie dull and unimaginative, the most expedient way to explain why is to compare it to other Star Wars movies. To accept any of this is to meet the film on its own terms, and treating it like the simple adventure movie it purports to be is to ignore the embarrassing amount of cultural space we’ve given to this franchise and how much it has metastasized through the film industry. For what it’s worth, Star Wars: The Force Awakens is my “favorite” Star Wars movie, at least in terms of the pleasant effects it produces and its general lack of pretension. Director J. J. Abrams and cinematographer Dan Mindel use the most dynamic camerawork in a Star Wars movie to date; previous films, especially those personally directed by George Lucas (the original Star Wars and all three prequels), used flat, theatrical blocking with static framing and created any necessary visual energy later on with editing and special effects. The fictional planets visited in the film are underwhelming retreads of earlier ones – a desert planet, a forest planet, a snow planet – but at least they are filled with practical puppets, props, and sets that give everything a tactile quality sorely lacking in other modern fantasy adventure films, and the overall art design has a sleek, cohesive look that combines the original film’s postmodern retro-futurist design by Ralph McQuarrie with today’s Apple iMacs and Toyota Priuses. There are also no racist stereotypes coded as aliens, which have otherwise been a staple of the series. Most importantly, though, the film seems to have a rejuvenated interest in the emotions of human beings. Like a lot of sequels, the story has too much work wrangling together all the previous characters and plotlines to ever come together as its own narrative, but, as someone who has never been impressed with George Lucas’s pillaging of mythology for his plot devices, that’s perfectly fine with me. At least it frees up the new characters from having to run through Joseph Campbell’s Hero’s Journey as pedantically as Luke Skywalker, and the re-focus on a small group of relatable characters is a welcome – and deliberate – shift away from pretentious mythic tropes and digital spectacle. The core of the movie is the budding friendship (and possible romance) between the two new protagonists, both of which are genuinely likeable and neither of which is a one-dimensional stock character: Finn (John Boyega), a deserter from the Stormtrooper forces who joins up with the heroic Resistance, and Rey (Daisy Ridley), a junk scavenger from some backwater planet whose strength in the Force establishes her as the next Jedi hero. There is also a plucky pilot named Poe Dameron, played by an equally likeable Oscar Isaac; he’s set up to be the third protagonist, but the film has little for him to do and he only pops up for a handful of scenes. This new trio is jammed up by the need to bring back all the old characters, but every major action set-piece involves at least two of the three, and they are always directly involved in the resolution of conflicts (which may sound like Screenwriting 101, but it hasn’t always been true in Star Wars movies). As effective as these characters usually are at holding the movie together, though, they are still mostly rehashes of earlier characters. The personality traits and dramatic functions of the original trilogy’s Luke Skywalker, Han Solo, and Princess Leia seem to have been divided up and redistributed among the new kids on the block: Finn is a bit like Luke and a bit like Han, Rey is a bit like Luke and a bit like Leia, and Poe is a bit like all three. Naturally, the writers repurposed the previous films to come up with the plot, but doing the same thing with the characters has some nonsensical results. 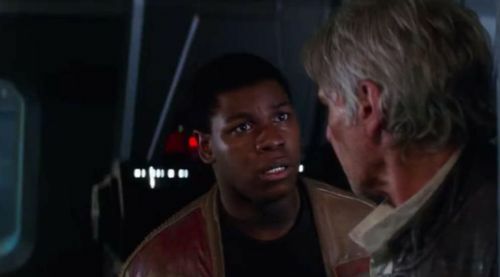 For instance, Finn says that he was abducted by Stormtroopers as an infant, brainwashed, and raised to be an unquestioning killing machine, but, like Luke Skywalker, he usually just acts like a kindhearted greenhorn who wants to make friends, kiss a girl, and do what’s right. The film can be quite shrewd with how it repurposes earlier characters and iconography. Yoda, one of the most iconic Star Wars characters, died in Return of the Jedi, but The Force Awakens has a ready-made Yoda surrogate, a diminutive alien innkeeper named Maz Kanata (voiced and performed with motion-capture by Lupita Nyong’o). Maz is female instead of male, orange instead of green, an ex-pirate instead of an ex-Jedi, and instead of big pointy ears she has giant goggles that make her look like Edith Head in a flight helmet, but she fills the same role as a wise gnome on a swamp planet who coaxes the Force-sensitive hero toward their destiny as a Jedi. Even more cloying is the new robot, BB-8, who looks like a mix of R2-D2 and an orange soccer ball and whose childish personality feels like Pixar’s WALL-E after a couple of cups of coffee. He’s cute, feisty, and loyal; he can even give a little thumbs up with his built-in welding torch. Once R2-D2 finally shows up at the end of the film, he seems slow, old-fashioned, and boring after seeing BB-8 tumble about for two hours. Everyone loves the family sheepdog until mom and dad bring home a Corgi puppy, and, as an embodiment of Disney’s efforts to revitalize Star Wars by modernizing the familiar, BB-8 has been the unofficial mascot for the new films ever since the first trailer for The Force Awakens was released. 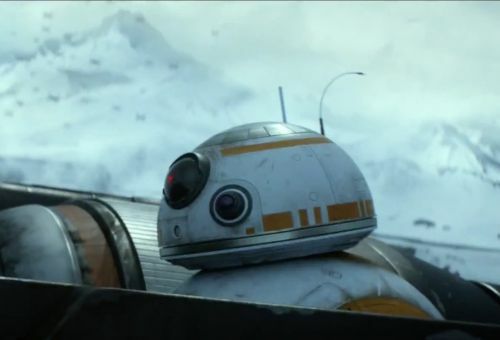 I’m sure BB-8 toys were selling like hotcakes in the week between the film’s release and Christmas day. In terms of story engineering, the film’s finest character is the new villain, Kylo Ren (Adam Driver), whose character solves two major problems for the filmmakers. First, Abrams, Disney, and the writers needed a reason to drive the original characters apart so the new characters could bring them back together, and Kylo Ren is both the son of Han Solo and Princess Leia (don’t worry if you haven’t seen it, it’s not a plot twist) and an ex-Jedi trained by Luke Skywalker, his uncle. Thus, having him turning to the Dark Side of the Force gives one simple, easy-to-understand reason for the original characters to separate. Second, they needed an excuse to bring back the iconography of Darth Vader, the most famous character in the franchise and (according to the pretentious “Chosen One” plot thread of the prequels) the most important person in the Star Wars universe. Kylo Ren is Darth Vader’s grandson and obsessed with carrying on his legacy, so he not only dresses up like Darth Vader and uses a red lightsaber, but also keeps Darth Vader’s helmet in his bedroom as a totem. Thus, without any tomfoolery about clones, time travel, resurrection, or other staples of pulp science fiction, the new Star Wars movies have their own updated take on Darth Vader that they can package and print on anything they want to sell. Adam Driver’s acting and the concise dialogue keep Kylo Ren from disintegrating into a mass of symbols and affectations, but, like all the other characters, he still feels synthetic. 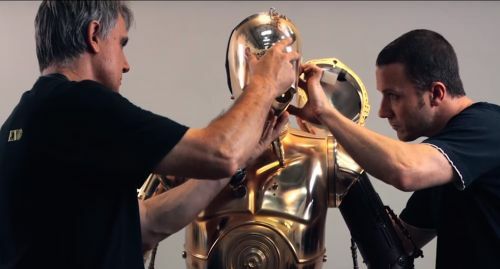 Nothing in the film is allowed to develop organically; everything is written backwards to solve problems created by previous Star Wars movies and Disney’s larger plans for the franchise’s future. Even at its most engaging, The Force Awakens feels like a complex piece of manufacturing equipment or computer software programmed to accomplish a certain set of tasks with as few actions as possible. 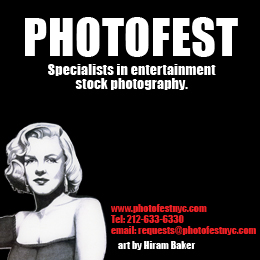 The results may often be genuinely fun, but you can still hear the gears whirring behind the scenes. For example, one obvious problem The Force Awakens had to solve in order to capture audiences was how to prove, as quickly as it could, that it was not like the Star Wars prequels. It does this in the very first scene (not counting the obligatory opening text crawl). One complaint fans had about the prequels was that they were visually dull, with flat camera angles, too much CGI, and overuse of green-screen stages, so, within the first two or three minutes, Stormtroopers that are clearly men in physical costumes attack a desert village that is clearly a practical set built on location, and the camera shifts from swooping crane shots to close-ups to wide angles in a battle scene reminiscent of the D-Day landing in Saving Private Ryan. Another complaint was that the prequels established that Stormtroopers were all clones of each other and, therefore, had no distinct personalities, but, in the midst of this battle, one Stormtrooper is singled out (he later turns out to be Finn, but, at this point, he still has his helmet on). He sees his friend die, gets scared, then refuses to kill civilians and tries to escape, which is more psychological activity than all the Clone Troopers in the prequel trilogy combined. Plus, since this is all done without any dialogue, it is also addresses yet another common complaint about the prequels: their boring expository dialogue. However, the burden of dealing with the rest of the Star Wars series keeps The Force Awakens from stretching out to forge its own identity, and the film has to run as fast as it can just to stay in one place. Reviewing the original Star Wars, Pauline Kael, echoing the sentiments of many other critics at the time, criticized the frantic editing and relentless pacing by saying “There’s no breather in the picture, no lyricism; the only attempt at beauty is the double sunset. It’s enjoyable on its own terms, but it’s exhausting, too[. ]” She would reel at The Force Awakens. It plows along like a bullet train, hitting every emotional note we expect it to but without building up to them properly. Most of these moments are direct or indirect references to the earlier films, appearing just long enough for you to catch a glimmer of recognition and laugh or cheer or gasp as the moment dictates, then disappearing so the next moment can come along. The result is that every moment is more or less equal in intensity as every other. Even the big showdown at the end – a remix of all three endings from the original trilogy – has no satisfying structure or moment of climax. Star Wars has always been a hodge-podge of images and scenes from other movies (“spare parts,” as Kael puts it), but The Force Awakens is a hodge-podge of images and scenes from other Star Wars movies. It could be a parody of itself if it weren’t so sincere. As ridiculous as it is that Star Wars is now generally considered one of our society’s most treasured works of art, it’s worth remembering just how weird and idiosyncratic the original film was: postmodern without a trace of irony, shamelessly kid-friendly yet targeted toward adults, a pastiche of Kurosawa’s samurai movies, John Ford westerns, Nazi propaganda, Arthurian legends, World War II thrillers, Flash Gordon and Buck Rogers, Weird Tales magazine, Cecil B. DeMille, Wagnerian opera, Taoism, and superhero comics. For better or worse, the original Star Wars feels like everything George Lucas consumed between the ages of five and thirty, and its most fascinating aspects are how these disparate and ethically questionable combinations interact. The Force Awakens, on the other hand, feels like everything J. J. Abrams consumed at the same age: Star Wars, Star Wars, and more Star Wars. The quality of the film is almost irrelevant. Its success was a foregone conclusion; for what other film could you imagine people lining up at the theater on opening night dressed as characters from the film, characters they know nothing about other than what they’ve seen in advertising materials? Some might dismiss these folks as eccentric geeks, but geek culture has been thoroughly mainstreamed by now (thanks largely to Star Wars itself and the films it’s influenced), and these geeks are simply externalizing the same impulse that drives most “regular” people to go see the film: the assumption that, because it is a Star Wars film, they will love the characters, have a blast, and form fond memories that will last a lifetime, and that, because it is a Star Wars film, even if they hate it, it will be loved and cherished by others for years to come and become a part of the cultural lexicon, so they had better see it anyway and damn well try to like it. Disney didn’t just bank on the Star Wars brand name, though. Having recently purchased the franchise from George Lucas for a king’s ransom, they had too much money riding on the movie’s success to take any chances – not just their initial investment, but all the money they plan on making churning out a new Star Wars movie every year from here to eternity. They only hired on bankable professionals who actually care about producing quality work, which is why The Force Awakens never feels like a cynical cash-grab, and they mostly kept Lucas out of the loop (and the advertising) to mitigate his unpredictable and unreliable imagination. J. J. Abrams has a distinct style, but he’s no auteur; he’s a tried-and-true hack director brought on board because his career is built on replicating the successful films of Steven Spielberg and George Lucas. The script was written by Oscar-winner Michael Arndt (who wrote Little Miss Sunshine and Toy Story 3, both wildly successful family-friendly films praised for their emotional depth) and revised by Abrams and Oscar-nominee Lawrence Kasdan (who wrote Raiders of the Lost Ark and co-wrote the first two Star Wars sequels). John Williams, now largely retired from film except for his collaborations with Spielberg, returned to compose the score, and all of the original cast members reprise their roles, including the ones under so much alien makeup and costuming that you can’t tell anyway. 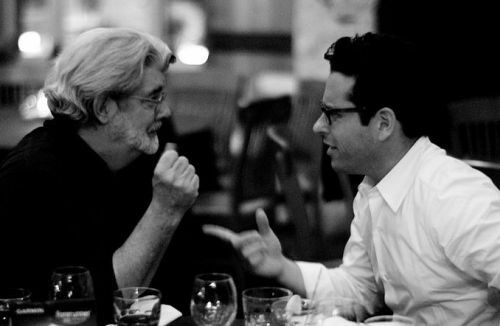 A cast and crew more likely to produce a Star Wars movie that audiences would actually enjoy could hardly be imagined. Unlike a lot of other blockbusters nowadays, Star Wars: The Force Awakens isn’t packed with cheap, lazy pandering. Disney can afford to not try and milk the film for every possible box office dime. Tickets to a new Star Wars movie practically sell themselves, and, in any case, the real money is in merchandising, so the movie has to be credible enough as a piece of entertainment to work as an advertisement for the merchandise. Toys, in particular, have always been an important part of how people interact with the Star Wars movies, allowing them to invent their own Star Wars stories to augment and improve upon the actual films. Star Wars fans may find that a bit insulting, considering how seriously many people take the films as grown-up entertainment, but, if so, take it up with Kathleen Kennedy, President of Lucasfilm, longtime collaborator of Spielberg and Lucas, and current head of Disney’s marketing initiative for the Star Wars series, who said the same thing.1 Kennedy was promoting the “Force Friday” sales event this past September, when all the toys for The Force Awakens were released on the same day worldwide – opening night for merchandise. 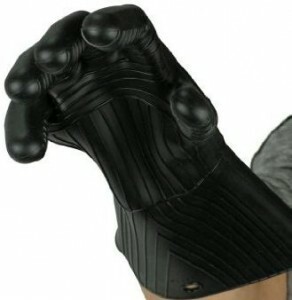 It’s easy to say that this is all for the kids, but the people beating down the doors to buy figurines and comic books weren’t all just parents shopping for their children, and, besides, is an adult-size silicone oven mitt shaped like Darth Vader’s glove less of a “toy” than a Darth Vader action figure? Even if you’re a working adult who hasn’t played with dolls in thirty years, you could still just about fill your entire house with Star Wars goodies: bedspreads, shoes, soap dispensers, bath mats, duct tape, Jedi-themed makeup from CoverGirl, Christmas ornaments, golf club covers, navel oranges with BB-8 on the package, cat toys, wine glasses, breakfast cereal, ice scrapers, every kind of kitchen utensil, chopsticks shaped like lightsabers, and toasters that burn a picture of Darth Vader onto your bread. It makes the merchandising gag in Spaceballs seem quaint. Dismissing this as simply capitalism at work doesn’t account for why a new Star Wars movie is treated like a significant cultural event even by those that don’t stand to profit from it. Local libraries in my area, for instance, have put up posters advertising the film’s release date – not official promotional posters, but crude signs printed out on office paper and taped to the wall. One library held screenings for all six of the other Star Wars movies for their weekly family movie nights, a program that otherwise screens films like Gigi, The Quiet Man, and The Wizard of Oz. They also have displays of Star Wars books, for children and adults. I suppose it might be better for people to read Star Wars novels than nothing at all, but if it promotes the idea that these books are just as good or better than everything else in the library and that Star Wars is a serious cultural institution independent of the occasional popcorn flick, I’m not so sure. One book I found in one of these displays is Star Wars: The Force Awakens: The Visual Dictionary. It’s a high-gloss, full-color miniature encyclopedia published by Dorling Kindersley, and it looks identical to their line of children’s reference books that cover subjects like human anatomy, dinosaurs, and the Vietnam War. It reads like a toy catalogue, with clear, crisp photographs of every character and prop in the film, arranged on the page like action figures in packaging. Well, actually, it doesn’t feature every character: Supreme Leader Snoke (Andy Serkis), a mysterious alien who controls the evil organization to which Kylo Ren belongs, is not depicted, presumably because the book came out several months before the film and they wanted his appearance to be a surprise. The actual plot of the film is not described, either, only the details of individual objects and characters that can be purchased as toys, betraying the book’s real function as an advertisement. The book sells the toys, the toys sell the movie, the movie sells more toys, the toys sell the next movie, the movies sell more books, et cetera, ad nauseam. The Visual Dictionary has a large photograph of a character named Dasha Promenti. As of this writing, I saw the film three days ago, and I don’t recall this character whatsoever, but, thanks to this book, I know that her blaster pistol has a handle carved from the tusk of a “dune zaywar” (the name of the actress who portrays her is not mentioned). Likewise, I don’t remember Poe Dameron’s spaceship having an orange and black paint job, but, according to The Visual Dictionary, it’s actually called Black One and is “a customized Incom-FreiTek T70 X-Wing Fighter coated with sensor-scattering ferrosphere paint.” It also says that this ship is BB-8’s favorite to ride shotgun in, a bit of context that might have made the split-second shots of the little robot doing so in the film actually mean something. If you saw the film, maybe you recall an alien with a red robe and a face like a horsefly’s abdomen during the early scenes on Rey’s homeworld of Jakku. His name is Sarco Plank, an ex-smuggler who works as a weapons trader and carries a customized blaster equipped with a “Tradoshan tripler.” It’s understandable if you don’t remember him: he stands in the background for a few seconds, has no lines, and does not interact with the characters. Nevertheless, you can buy the Desert Mission Sarco Plank action figure pack from Hasbro, complete with two accessories, and find out about his adventures with a young Luke Skywalker in the children’s novel The Weapon of a Jedi and an animated version available from Nestlé when you go to one of their websites and enter a promotional code from a cereal box. You can also buy a matching figurine of Constable Zuvio, an alien character that was featured prominently in early marketing, given almost a full page in The Visual Dictionary, then cut from the film entirely. If it were just a line of toys and games that adults could easily ignore, like Skylanders or Bionicle, Star Wars would just be another harmless marketing nuisance, but we’ve been living with it for two or three generations and now it’s venerated as a pillar of our society. Star Wars is as much a part of the standard American childhood as baseball and Santa Claus, and kids who grow up and refuse to let go of their cherished space adventure movies will find their tastes validated by film publications that regularly put them on lists of the Greatest Films of All Time, histories of cinema that inevitably describe them as a major turning point for the artform, and endless reams of criticism comparing them to epic poetry and holy scripture. Much of The Force Awakens works because it sets off just enough tiny firecrackers of nostalgic recognition to maintain the common reference points that keep Star Wars in the public consciousness. Sometimes it’s obvious, such as an aging Han Solo and Chewbacca reuniting with their long-lost Millennium Falcon, but sometimes it’s more oblique: Maz Kanata is not Yoda, but we immediately understand her as being “like Yoda,” reinforcing the unfortunate reality that a goofy puppet is our culture’s most convenient paradigm for a spiritual sage. This canon of characters and stories can give the impression of a sincere collective dream, something akin to a real mythology or folklore, but it’s illusory. The spiritual sage as an archetype is not copyrighted, but Yoda is. The marriage of Disney and Lucasfilm is a match made in heaven. Disney – the man and the company – spent the better part of a century trying to homogenize the world’s art and literature into its own marketable brand; George Lucas did it with a single film. Between its own cartoons and live-action films, Star Wars, and the Marvel superhero movies it produces, Disney now has something close to a monopoly on childhood imagination, and Uncle Walt’s dream of an eternal childhood is closer than ever. Folks who grew up on Star Wars and Disney princesses now delight in them as grown-ups with the smiling approval of the cultural mainstream, and the popularity of young adult fiction is skyrocketing because of fully adult readers. The escapism is inescapable. The Force Awakens, like all its ilk, assures us that growing up isn’t all it’s cracked up to be, and if you want to get to its galaxy far, far away, you just need to fly to the second star to the right, straight on till morning. J. R. Jones recently described Star Wars as “the franchise that wrecked American cinema.”2 That may sound hyperbolic, but almost every common complaint I hear about modern movies, from critics and regular moviegoers alike, can ultimately be traced back to Star Wars: constant sequels, prequels, remakes, and spin-offs; repetitive and unoriginal writing; emphasizing special effects over character or drama; serializing stories to maximize profits; etc. These individual elements are as old as cinema itself, but Lucas pioneered a kind of filmmaking – not only in Star Wars but also the Indiana Jones series he made with Steven Spielberg – that synthesized all of them into a cohesive philosophy of what movies should do: Movies should be an escape from real life. Movies should tell old stories, not new ones. Movies should have sequels. Movies should have prequels. Movies should sell merchandise. Movies should expand their fictional settings into other media. Movies should protect the long-term financial security of the franchise to which they belong. Movies should be easy to understand. Movies should appeal to as many people as possible. Movies should feel like other movies. Movies should feel like amusement park rides. Movies should make you feel like a child again. Movies should make more money than all previous movies. This is all now the industry standard. As sad as it is, I’m hard-pressed to think of anyone from the past fifty years who has done more to change how movies are made than George Lucas. 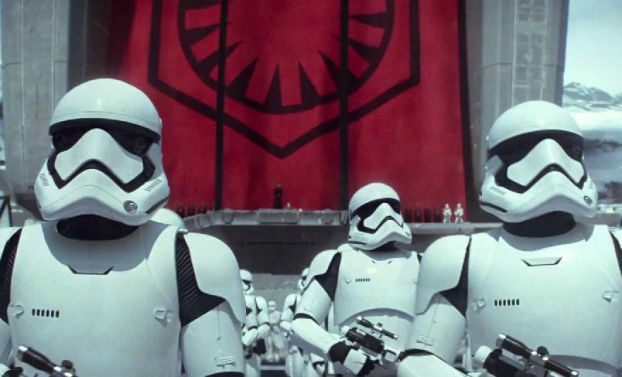 The Force Awakens isn’t just a sequel to Star Wars; it’s a symptom of it. The clearest expression of the Star Wars ethos is in Episode I – The Phantom Menace, when Jedi master Qui-Gon Jinn (Liam Neeson), teaching a young Anakin Skywalker (Jake Lloyd) the ways of the Force, says “Remember, concentrate on the moment. Feel, don’t think. Trust your instincts.” Like all previous Star Wars films, the numerous pleasures of The Force Awakens are always momentary and fleeting, carefully crafted to be forgotten as soon as the next one comes along. Why worry about the past, or the future? If it seems like a lot of fun, trust your instincts. Feel, don’t think. The true genius of Star Wars wasn’t just that George Lucas found a way to combine numerous genres and periods of history into a single science fiction vision of the future, but that he did all that and then stuck that vision of the future into the distant past, in another galaxy, where it has no direct connection to our world or history. It’s an apathetic cynicism hidden inside optimistic narratives, a conceit that has allowed the series to mix and match the roles of Christians knights and Buddhists priests, to use Nazi imagery for its heroes and villains alike, and to implicitly compare a protagonist to both a samurai warrior and the pilot who dropped the atom bomb on Hiroshima. “Don’t worry,” these movies say, “it’s all just for fun, none of this affects real life.” If only. Unless otherwise indicate, all images are screenshots from various trailers freely available on YouTube.